I am tired of this kind of post but it needs to be done. I was looking for a milk for my son to bring to school because he said that the school milk didn’t taste very good. I remembered these Horizon milks at the store and thought I would see if there was one that would be acceptable. No high fructose corn syrup! Organic cocoa! 8 grams of protein! But on the thing that matters to this consumer the most? Twenty-two grams of sugar – and that means that they added 12 grams because milk naturally has about 11 grams in an 8 ounce serving. Twelve grams is about 2.5 teaspoons. 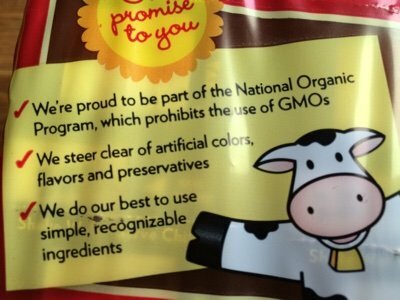 Every thing about Horizon – non-GMO, organic – goes out the window if they are adding a highly addictive substance to their product in large amounts. I ask the question – does it need to be SO sweet? How about Horizon makes a promise to cut the sugar in half. This way we are supporting the environment and the continued health of our children AT THE SAME TIME. Does this kind of product make you angry? Or should I get off my high horse? I would hope most moms are aware that choc, van, or strawb anything is a treat not an everyday lunch thing. 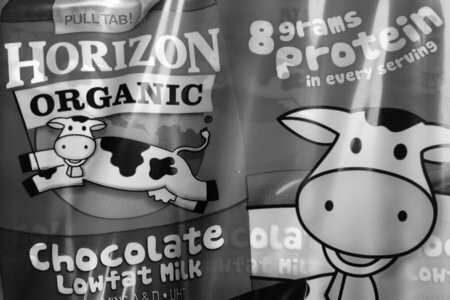 Horizon is a pretty good brand in my book, keeping it real, including their non-flavored milk with no added sugar. I always loved choc milk as a kid [ok even now] but I def drink it as an occasional treat much like hot chocolate. yum. Its chocolate milk - extra sugar is pretty much expected. Plus, if it wasn't sugar it would be some chemical substitute. I totally agree with you; I still think it would be sweet enough with half the sugar! Go Snack Girl!! Not angry... It's chocolate milk! The low fat organic white milk has 12g of sugar. I'm thinking with the 12 grams of sugar already in it,that should be sweet enough. It's adding the chocolate that is adding more sugar, isn't it? ?How can you have chocolate milk without adding chocolate??? My kids hate the taste of white milk (and frankly, so do I). Since yogurt is also honestly a "treat" as well, their dairy intake is almost solely cheese. So if I can give them some chocolate milk now and again, sugar or not, I'm happy that it's a method to actually get them to drink it! My concern would be what is it about the school milk that doesn't taste very good. Is it out of date? Not refrigerated properly? In any case, I think chocolate milk should be a treat, not something put in a child's daily lunch box so then wouldn't worry about the extra sugar once in awhile. I wish you had access to Winder Dairy products. They're all local and they have a no sugar added option for their chocolate milk--and it's good. This one does of 12 grams of sugar. For some reason there are whispers of sucralose...but I can't verify it and that makes no sense to me knowing who made it. My problem with this product is the deception for folks who don't read labels or can't understand them. The product professes healthy, natural(the most over used word in product marketing). I think most folks just believe this is a healthy alternative unaware it is liquid candy. Hate to say it holly, but yes, https://homedelivery.winderfarms.com/HOMS/ViewProductDetail?mid=0&smid=0&p=00001218 there's sucrose, ace-k, and carrageenan in there. Sounded like a good enough thing I had to look it up! Yes this makes me angry. It is difficult enough to keep our children healthy. Please continue to reveal these deceptions! It is infuriating as their branding appears wholesome and healthy. What I found worse was their vanilla milk! I am glad I checked the ingredients because they use syrup instead of a vanilla bean! I would assume chocolate would not be too healthy but vanilla seems like it would be a little better....until you read the label!!!! We use Silk Dark Chocolate Almond milk, 17g of sugar - less protein and a much higher sodium content but it also has potassium, vitamin E, magnesium, and a higher amount of calcium. Doesn't come in convenient lunch box sizes but my kid takes a thermos for water and a second one when he wants something other than water for the day. I too get annoyed at how much sugar gets added to our food by the food companies. 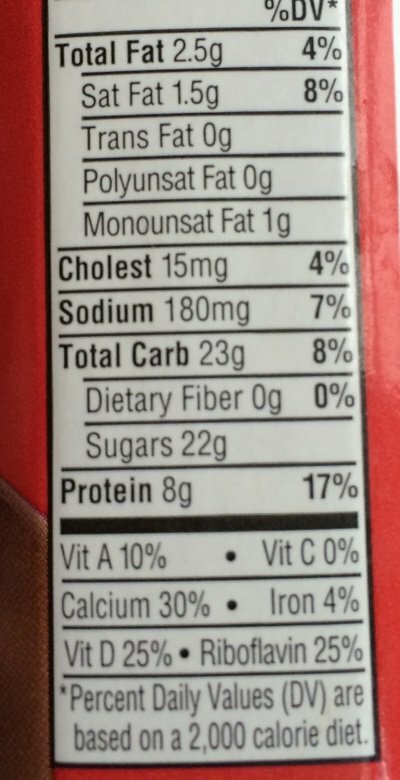 Even though this is chocolate milk and a little sugar would be expected, adding 12 grams (2.5 teaspoons) seems excessive. Perhaps an added 6 grams would be more reasonable and still give the chocolate milk a sweet taste. How can you expect chocolate milk to not have a bunch of sugar? Its chocolate milk for goodness sake! Totally agree! It's ridiculous what we feed our kids thinking it is healthy. My daughter's kindergarten snacks include "fruit" bites and animal crackers in the promise that all snacks are healthy. Thank you for this post. It's a good reminder. YES! Thank you! Please keep up the pressure on these companies to reduce added sugars. Our kids don't need it. I don't mind it that much because it's not like they will be drinking it everyday it will be a once in a while type of thing. A friend of mine actually makes her own chocolate milk for her son. It takes a while, but she knows what is in it. So I say if prepackaged upsets you, do what she does and make your own. I think I will.I've learned that as tired as I may get, by scratch is the best way to do it. That way I know what is going into my body and I have no one to blame but myself. No, chocolate milk does NOT need to have a bunch of sugar. Chocolate anything does not need a bunch of sugar. However,eating all the other stuff that is overloaded with sugar has programmed many people into thinking they need to have things overly sweet. Don't eat anything sweet for one week; then taste this milk. It will be disgusting.